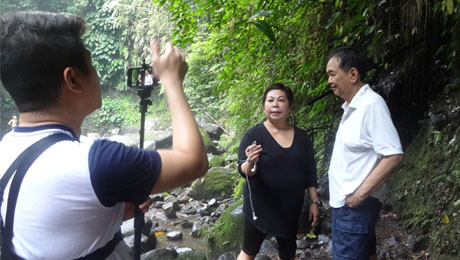 PASIG CITY- Despite a busy third quarter due to its healing work, ATHAG took the time to join the clean air advocacy, conduct a basic Hilot training and a seminar, and assist the DZMM Pinoy Vibes’ team during the production of its September feature on Mt. Banahaw. DZMM Pinoy Vibes host Stargazer talks to ATHAG President Bibiano “Boy” Fajardo about Mt. Banahaw. DZMM Teleradyo’s early morning program, “Pinoy Vibes,” featured Mt. Banahaw and traditional healing for the entire month of September 2015. Hosted by popular psychic “Stargazer,” the episodes aired from 1:00-3:00 a.m. each Sunday of the month. With the theme, “mystical journeys,” Stargazer took her loyal TV and radio audiences along as she went to Mt. Banahaw to explore its mystic and spiritual offerings. With ATHAG President and longtime albularyo Bibiano “Boy” Fajardo as her guide, Stargazer trekked to the major puwestos (shrines) in Mt. Banahaw, lit candles at designated sites, and experienced the twin waterfalls of Sta. Lucia. She also talked to different healers. The four-week series was part of Pinoy Vibes’ anniversary celebration. ATHAG President Bibiano “Boy” Fajardo signs a Memorandum of Agreement with Museo Pambata’s CEO Ms. Nina Lim-Yuson (center) and Executive Director Maricel Montero (left) after the seminar. 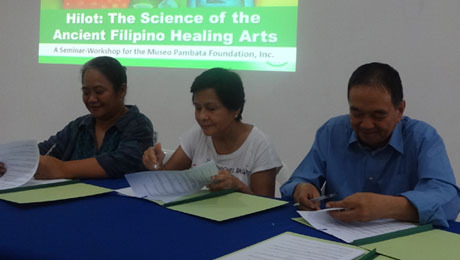 On Sept. 14, 2015, ATHAG conducted a seminar-workshop on traditional Hilot healing for the administrators and staff of Museo Pambata Foundation, Inc. (MPFI). ATHAG President and Albularyo Bibiano “Boy” Fajardo explained the history, concepts, and philosophy behind traditional Hilot healing. He also discussed the principle of the Four Elements of the Body and what organs are covered by each element. He also explained in detail how the traditional bulong/orasyon, Hilot, and medicinal plants work together to facilitate healing. In the afternoon, there was a brief discussion of how to determine imbalances in the body and the basic guidelines for performing Hilot. Afterwards, a hands-on session was conducted for MPFI admins and staff who wanted to try performing basic Hilot. The activity was capped off with a signing of the Memorandum of Agreement between ATHAG and MPFI. Ms. Aleli Pansacola addresses the participants. 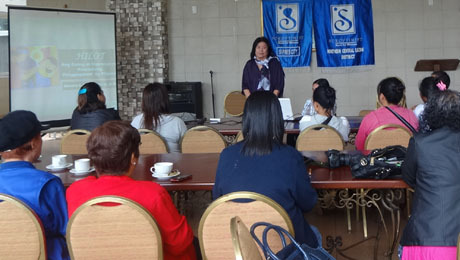 In partnership with the Soroptomists of this cool mountain city, ATHAG conducted a training on traditional Hilot healing at Jack’s Grand View from Aug. 31 to Sept. 4, 2015. ATHAG President Bibiano “Boy” Fajardo taught the participants the principles and how to’s of traditional Hilot healing, assisted by ATHAG manghihilot Karen Reyes and Yolanda Pedrigal. Meanwhile, Ms. Aleli Pansacola took charge of the livelihood component on the last day of the training. ATHAG joins hundreds of other healers and environmental advocates in signifying their support to the campaign for clean air by sticking paper leaves on the bare trees on the stage. Because breathing clean air is essential to life and health, ATHAG joined hundreds of other healers, health advocates, religious, members of the academe, and other sectors who responded to the invitation of the Clean Air Advocates Philippines (CAAP) to its congress entitled, “SONA: State of the Nation’s Air” held on July 25, 2015 by the Coalition of Clean Air Advocates of the Philippines (CCAAP), in cooperation with the United Healers League of the Philippines, Inc. (UHLPI). Various speakers from different sectors spoke about the importance of clean air. 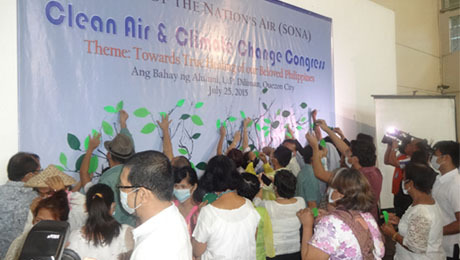 The highlight of the activity was the putting of leaves on bare-branched trees on the stage to symbolize the call for the implementation of the Clean Air Act. How can I buy your Hilot book from overseas? Thanks. Thank you for your interest in Hilot. Which part of the world are you in?